So you're off to the hardware store or local lumber yard to pick up some alder plywood. It is for an important project and you have a deadline to meet, so you rush out as fast as you can. It's a clear day out, so you don't expect much to happen. It is these situations that Murphy's Law likes to show its ugly head. The next thing you know, you are half way home when a thunder storm hits. 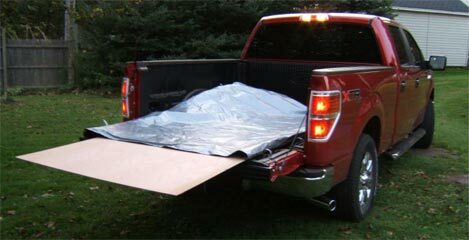 Five sheets of alder plywood in the back of your pickup are ruined. The above situation might not be typical, but non the less, things like this do happen. Though it would have never been a problem if you had purchased the Kerry-All plywood pouch. The Kerry-All is made up of 11-mil. woven polyethylene and is designed to be the ziptop bag of the construction world. Once your precious plywood is safely nestled inside, a Velcro strip seals to keep the weather out. Oh, it doesn't rain where you live? No one is safe. Did you know that wood veneers will darken in the sunlight? Uneven color is not what you want. Of course, they wont darken if they are inside the Kerry-All, that just so happens to be treated with an ultraviolet inhibitor. It looks like they thought of it all. The Kerry-All Plywood Pouch costs around $60 and is slightly larger then a 4' x 8' sheet to allow for a bit of wiggle room and can hold between 6 to 8 sheets of 3/4” material. It is more costly then some plastic or a tarp, but we all know how well those work to keep the water out. If plywood is not your thing, Kerry-All has a number of other options, including, the Trim Pouch, Drywall Pouch, Pallet Pouch, and more. If you want to support a small business, give them a try. Video in action proof, after the Read More.